"Science Magazine" and "Science (magazine)" redirect here. For other uses, see Science (disambiguation). Not to be confused with Science Journal (1965–71 magazine). Science, also widely referred to as Science Magazine, is the peer-reviewed academic journal of the American Association for the Advancement of Science (AAAS) and one of the world's top academic journals. It was first published in 1880, is currently circulated weekly and has a subscriber base of around 130,000. Because institutional subscriptions and online access serve a larger audience, its estimated readership is 570,400 people. The major focus of the journal is publishing important original scientific research and research reviews, but Science also publishes science-related news, opinions on science policy and other matters of interest to scientists and others who are concerned with the wide implications of science and technology. Unlike most scientific journals, which focus on a specific field, Science and its rival Nature cover the full range of scientific disciplines. According to the Journal Citation Reports, Science's 2015 impact factor was 34.661. Although it is the journal of the AAAS, membership in the AAAS is not required to publish in Science. Papers are accepted from authors around the world. Competition to publish in Science is very intense, as an article published in such a highly cited journal can lead to attention and career advancement for the authors. Fewer than 7% of articles submitted are accepted for publication. 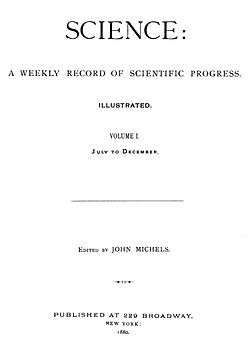 Science was founded by New York journalist John Michels in 1880 with financial support from Thomas Edison and later from Alexander Graham Bell. (Edison received favorable editorial treatment in return, without disclosure of the financial relationship, at a time when his reputation was suffering due to delays producing the promised commercially viable light bulb.) However, the journal never gained enough subscribers to succeed and ended publication in March 1882. Entomologist Samuel H. Scudder resurrected the journal one year later and had some success while covering the meetings of prominent American scientific societies, including the AAAS. However, by 1894, Science was again in financial difficulty and was sold to psychologist James McKeen Cattell for $500. After Cattell's death in 1944, the journal lacked a consistent editorial presence until Graham DuShane became editor in 1956. In 1958, under DuShane's leadership, Science absorbed The Scientific Monthly, thus increasing the journal's circulation by over 60% from 38,000 to more than 61,000. Physicist Philip Abelson, a co-discoverer of neptunium, served as editor from 1962 to 1984. Under Abelson the efficiency of the review process was improved and the publication practices were brought up to date. During this time, papers on the Apollo program missions and some of the earliest reports on AIDS were published. Biochemist Daniel E. Koshland, Jr. served as editor from 1985 until 1995. From 1995 until 2000, neuroscientist Floyd E. Bloom held that position. Biologist Donald Kennedy became the editor of Science in 2000. Biochemist Bruce Alberts took his place in March 2008. Geophysicist Marcia McNutt became editor-in-chief in June 2013. During her tenure the family of journals expanded to include Science Robotics and Science Immunology, and open access publishing with Science Advances. Jeremy M. Berg became editor-in-chief on July 1, 2016. In February 2001, draft results of the human genome were simultaneously published by Nature and Science with Science publishing the Celera Genomics paper and Nature publishing the publicly funded Human Genome Project. In 2007 Science (together with Nature) received the Prince of Asturias Award for Communications and Humanity. In 2015 Rush D. Holt, Jr., chief executive officer of the AAAS and executive publisher of Science, stated that the journal was becoming increasingly international: "[I]nternationally co-authored papers are now the norm—they represent almost 60 percent of the papers. In 1992, it was slightly less than 20 percent." The Science family of journals includes Science, Science Translational Medicine, Science Signaling, and Science Advances. In 2015, Holt announced another expansion: Science Robotics and Science Immunology would begin publication in mid-2016. The latest editions of the journal are available online, through the main journal website, only to subscribers, AAAS members, and for delivery to IP addresses at institutions that subscribe; students, K–12 teachers, and some others can subscribe at a reduced fee. However, research articles published after 1997 are available for free (with online registration) one year after they are published i.e. delayed open access. Significant public-health related articles are also available for free, sometimes immediately after publication. AAAS members may also access the pre-1997 Science archives at the Science website, where it is called "Science Classic". Institutions can opt to add Science Classic to their subscriptions for an additional fee. Some older articles can also be accessed via JSTOR and ProQuest. The journal also participates in initiatives that provide free or low-cost access to readers in developing countries, including HINARI, OARE, AGORA, and Scidev.net. Other features of the Science website include the free "ScienceNow" section with "up to the minute news from science", and "ScienceCareers", which provides free career resources for scientists and engineers. ^ "Science Magazine". Aaas.org. Retrieved February 8, 2013. ^ "AAAS – AAAS News Release". Aaas.org. Retrieved May 15, 2010. ^ "AAAS Annual Report-Science". Aaas.org. Archived from the original on May 25, 2010. Retrieved May 15, 2010. ^ Lemonick, Michael D. (March 7, 2011). "Alien Life Discovered in a Meteorite! Or Maybe No" (online web page). Time magazine online. Retrieved October 3, 2011. The paper, meanwhile, had been published in Science, one of the world's top scientific journals, which gave it even more apparent gravitas. ^ "Science". 2015 Journal Citation Reports. Web of Science (Science ed.). Thomson Reuters. 2016. ^ Grosvenor, Edwin S; Wesson, Morgan (May 13, 2016). Alexander Graham Bell. New Word City. ISBN 978-1612309842. In 1881, the old rivalry between Bell and Thomas Edison spilled over into the field of publishing. Science Magazine had been founded the year before with funding from Edison, but the frugal inventor soon tired of the deficits and withheld support. Bell had written for the magazine and respected its editorial quality. He felt that Science, like the British Nature, appealed to a broad audience interested in current research. In 1882, he and Gardiner Hubbard acquired the rights to Science and hired as editor a respected young entomologist and riter named Sam Scudder, who happened to be a Hubbard cousin. ^ David Baron (2017). American Eclipse. Liveright. p. 224. ISBN 9781631490163. ^ "150 Years of Advancing Science: A History of AAAS. AAAS and Science: 1900–1940". American Association for the Advancement of Science. Retrieved August 27, 2006. ^ "Online Exhibits". American Association for the Advancement of Science. Retrieved August 27, 2006. ^ a b "150 Years of Advancing Science: A History of AAAS. AAAS and the Maturing of American Science: 1941–1970". American Association for the Advancement of Science. Retrieved October 3, 2013. ^ a b "150 Years of Advancing Science: A History of AAAS. Change and Continuity: 1971 to the Present". American Association for the Advancement of Science. Retrieved August 27, 2006. ^ Pinholster, Ginger (December 17, 2007). "Bruce Alberts Named New Editor-in-Chief of Science". American Association for the Advancement of Science. ^ Gramling, Carolyn (April 2, 2013). "Marcia McNutt Bringing Her 'Intellectual Energy' to Science". Science. American Association for the Advancement of Science. Retrieved September 21, 2013. ^ Van Noorden, Richard (February 12, 2014). "AAAS announces open-access journal". Nature. Retrieved February 12, 2015. ^ Kaiser, Jocelyn (May 25, 2016). "Jeremy Berg named Science editor-in-chief". Science. American Association for the Advancement of Science. Retrieved July 1, 2016. ^ Journal Science. Fundacionprincipedeasturias.org. Retrieved on 2013-06-20. ^ Holt, Rush (June 29, 2015). "Scientific Drivers for Diplomacy". Science and Diplomacy. ^ "ScienceNow". Science. Retrieved September 1, 2011.